Stratasys Art Design and Fashion reveals a new 3D printed artwork series, Beast of the Anthropocene, created in collaboration with innovative product designer Dov Ganchrow. This marks the latest addition Stratasys’ The New Ancient Collection. 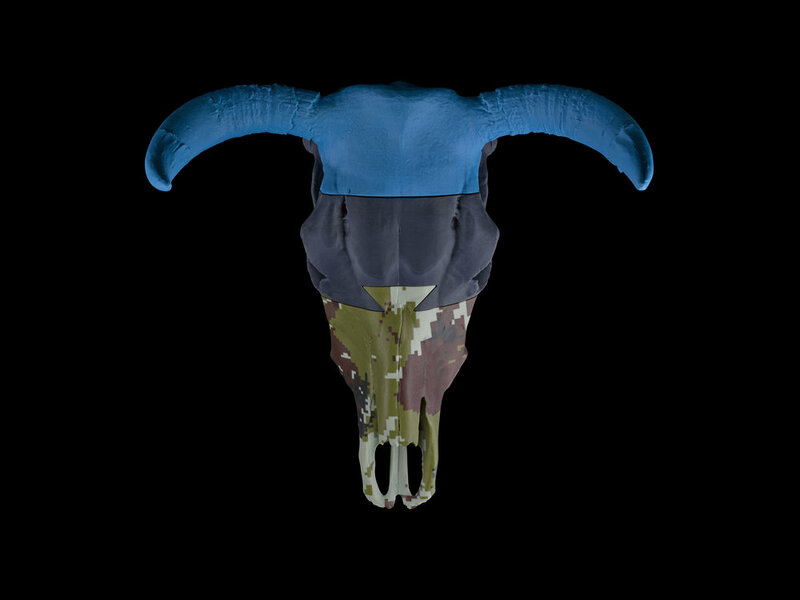 Drawing upon man’s fascination with skulls, the Beast of the Anthropocene series of works consist of both real and 3D printed cow skulls that have been altered in various ways with a playful design attitude. The series seeks to highlight man’s ever-evolving need to reshape the natural to better suit our needs. The cow skulls were collected over several years of off-trail hill hiking. One of the more complete specimens was 3D scanned to record its exterior topography and then sectioned with dove tail geometry into three portions: the front, central and horn area. A modular mechanical system has been imposed on the skull, not only allowing for fixed linear motion between the parts, but also creating a means by which parts are interchangeable. In addition, the object can afford many additions and alterations, either virtually with digital design or manually, with a drill and saw. “At some point we shifted from being Man as Nature to Man in Nature. This laid the groundwork for what we have been doing for a long time and at an accelerated rate – reshaping the natural to better suit our needs,” explains Dov Ganchrow. A cow is a perfect example of an ‘object from the Anthropocene', having been transformed by humans over centuries, from wild beasts to managed resources, such as meat, milk-making mechanisms and leather suppliers. The natural flowing organic skull surfaces end abruptly at decisive flat planes – a violent shaping of the form with a clear chronology and relationship. Human intervention here is bold and pronounced. As both the 3D printed and original skull works have a plastic color finish to them, it is not immediately evident to viewers which objects are bone and which are polymer. This leads us to consider how our knowledge that an object is real might affect our relationship to it. Can we attach the same profoundness to something that was manufactured as to something that was alive? The first skull from the Beast of the Anthropocene collection have been unveiled at the newly opened exhibition, Uncanny, part of the Design Lab at the Holon Design Museum in Israel. The exhibition is a manifestation of the Freudian term "Uncanny", which describes the sense that is provoked when we come upon phenomena that blur the line between the real and the imagined, the human and the non-human, giving rise to a paradoxical combination of strange and familiar elements. The exhibited works provoke a sense of discomfort, while raising questions concerning the possibility of creating something new out of familiar things. To see the first skull from the Beast of the Anthropocene collection, visit the Uncanny exhibition at the Holon Design Museum, running from June 6 - October 20, 2018. 3D printing continues to inspire fashion designers by challenging the boundaries of modern design and offering them new ways of thinking. Stratasys has been involved in numerous collaborative fashion projects with some of most well-known innovative designers including Neri Oxman, threeasFour, Iris Van Herpen and Julia Koerner and the avant-garde 3D printed fashion pieces have featured at various Paris and New York Fashion Weeks and catwalks. June 14th 2018 saw the opening of Fashion Statements, a new exhibition at the Israel Museum, which celebrates a century of dress in Israel. Two 3D printed dresses from Stratasys’ creative directed collaboration with Noa Raviv, which form part of Noa’s ‘Hard Copy’ collection, feature in the exhibition. The 3D printed dresses debuted at London Design Week in 2014 and have also featured in the ‘Manus x Machina’ exhibition at the New York’s Metropolitan Museum of Art (MET) and the ‘Techstyle’ exhibition at the Museum of Fine Arts (MFA) in Boston. Led by chief curator Daisy Raccah-Djivre, the Fashion Statements exhibition comprises an impressive display of clothing, fashion sketches, films and fashion photography, illustrating the broad scope of fashion in Israel – from its deepest historical roots to contemporary collections, fostering a dialogue about tradition and modernity, myth and reality, and conflicting ideologies. Visitors will be taken on a journey from the late 19th-century indigenous pre-Zionist ‘fashion’, to the opposing forces of Europeanism and Orientalism that converged in the early decades of the state, while finally evolving to the place that Israeli creativity holds on the global fashion scene today. Noa Raviv’s ‘Hard Copy’ dresses feature a series of 3D printed black-and-white pieces and hand sewn on ruffled fabrics and grid-like patterns. These voluminous shapes were produced using Stratasys Connex Color, Multi-material 3D printing technology, allowing Noa Raviv to perfectly realize her vision of non-symmetrical distorted grid patterns and shapes. Using combinations of black and white rigid materials, the 3D futuristic shapes were sown together with 2D laser cut fabric, creating an optical illusion of 2D and 3D elements, cleverly alluding to the tension between the real and the virtual. Stratasys 3D printed fashion pieces, designed by Noa Raviv, produced on Stratasys’ Objet500 Connex Multi-material 3D Printer, on display at the Fashion Statements exhibition, Israel Museum. As exemplified by the exhibition, the role of 3D printing in fashion is continually evolving, and we are seeing a notable increase in awareness and interest in the technology from designers. Stratasys works with leading fashion companies to explore new ways of approaching design, traditionally thought unattainable, and supports designers to discover uncharted grounds in contemporary fashion that can be realized with 3D printing. This year, the Stratasys Art, Design and Fashion team have been focused on developing a new technique: 3D printing directly onto textiles. “The aspiration of the team is to uncover how 3D printing can actually work in harmony with textiles and to discover how, in the future, it will be able to replace the textile itself in some cases,” explains Naomi Kaempfer, Creative Director of Art Design and Fashion at Stratasys. “By combining traditional textile materials with digitally-created 3D printing materials, the gap between the two techniques is being bridged, enabling a faster integration of the technology in textile design”. With great support from R&D, led by Stratasys' Innovative Solutions Expert, Boris Belocon, this year marked the first time that 3D printing with textiles has been achieved using Stratasys’ high-resolution PolyJet 3D printing technology – representing an interesting breakthrough for the industry. An inspiring example of this can be seen in Iris Van Herpen’s latest haute couture collection “Ludi Nature”. The foliage dress incorporates traditional textiles with 3D printed plastic elements utilizing Stratasys PolyJet 3D printing technology. Three variations of the 3D printing material were altered on a droplet level, achieving the unique color and transparency on the dress which allows it to seamlessly fuse with the fabric material. Material developments are another key element to accelerating the adoption of 3D printing technology within fashion design. Digitally-created materials are offering up vast possibilities as every element of a garment or textile can now have its own individual digitally manipulated physical properties. For example, we can create a specific textile that is waterproof, opaque, flexible or rigid and then combine these elements together enabling all of these properties to be present in a single garment. Further to collaborative work with acclaimed fashion designers, Stratasys is dedicated to opening up design possibilities for the next generation of designers. As such, Stratasys proudly supports graduation projects in the fashion domain, educating students on the benefits of 3D printing technologies and encouraging them to explore new design solutions. Some of these student projects will be on display at the Fashion Statements exhibition, later on in the year. If you would like the opportunity to see Stratasys fashion items today, the Fashion Statements exhibition is running at the Israel Museum from June 14th2018 - January 2019. For further information on fashion projects visit the Stratasys Art, Design and Fashion website.